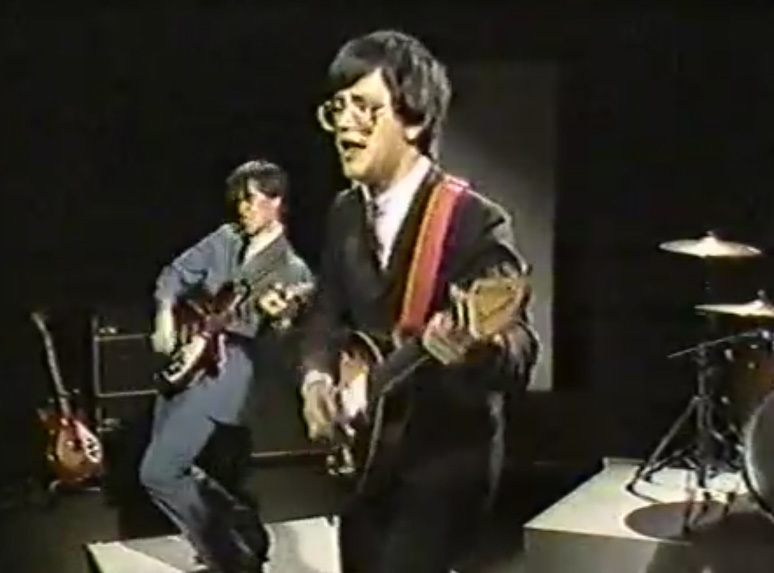 Tell-Tale Hearts performed on local public access TV in late 1983. The video was shot for a Cox Cable public access TV program called Club 33, which broadcast local bands performing on Friday nights at 7:30 pm on KCOX channel 33. Hosted by Bill “Hergon” Hergonson of KGB FM's morning show, produced by Jim Lee, and taped in the Cox studio then located behind Parkway Plaza, the show began as a 13 week experiment that proved so successful that it was renewed indefinitely. Groups featured on the one-hour program included recently reunited bands such as Manual Scan, N-E-1, and the Monroes, as well as long gone acts such as Laws of Motion, the Neat, Urban Umbrella, Victim, the Norm Norman Band, Opal, the Dynamics, the New Presidents (featuring the future frontman of Robert Vaughn & the Shadows), and a beer-soaked Beat Farmers performance that almost got the show closed down. The San Diego Reader recently acquired a 1980s beta videotape collection of local public access music programming, with clips uploaded to the Local Video Jukebox. Many seen in the footage have contacted the paper to express astonishment; Club 33 hasn’t screened locally since 1986, and Cox reportedly disposed of all their master tapes when they relocated to a new facility. Few musicians we've tracked down seem to have copies. December 1983 episode of Club 33 featuring the Tell-Tale Hearts performing "Hey Tiger." 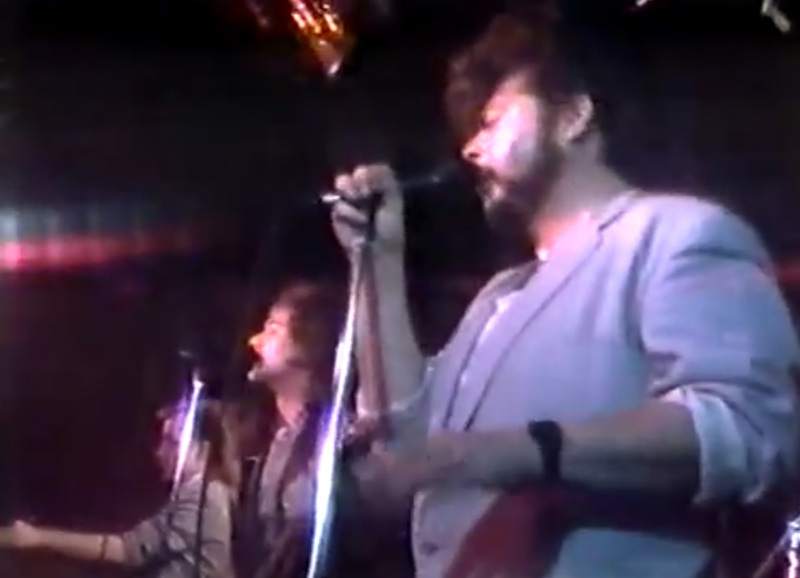 The Club 33 clip of garage legends Tell-Tale Hearts performing "Hey Tiger" hit 1200 views within days of uploading. "The band had only been together for less than half a year at that point," recalls Mike Stax, who currently fronts the Loons. "We'd just recorded a demo of four or five songs at Studio 517, which was a rehearsal space and sometimes an informal live music venue at 517 Fourth Avenue, in what's now the Gaslamp District, then just a rundown part of downtown. That demo was what we lip-synched to on the TV show." "There was some discussion among us beforehand that it was a bit cheesy having to pretend to play, but I made the argument that we should try to make it look as convincing as possible. We'd seen enough footage of bands in the 60s lip-synching on TV to know that it never looked good when the band made a point of not playing and singing with any feeling, or goofed around trying to send up the phoniness of it all. So we moved around much as we did onstage and played all the parts, even though our instruments weren't plugged in. It was a good decision, because the clip captures the spirit of the band quite well." 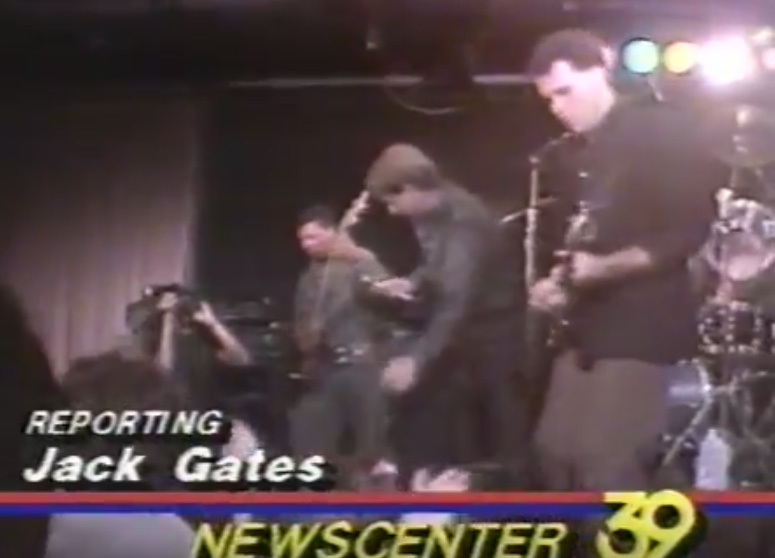 San Diego's Newscenter 39 reporter Jack Gates does a story in June 1984 about Club 33, featuring clips of a taping with Urban Umbrella and an interview with Cox programmer Maya Gallagher. "I did have this clip on VHS at one point, but lost it or loaned it to someone, so when it resurfaced on YouTube it was the first time in at least 30 years that I'd seen it. I think it's the best video footage there is of the Tell-Tale Hearts. This was when the band was at its best: raw, fun, and united in our status as musical and stylistic outsiders, determined to drag the lame 1980s back to 1966." 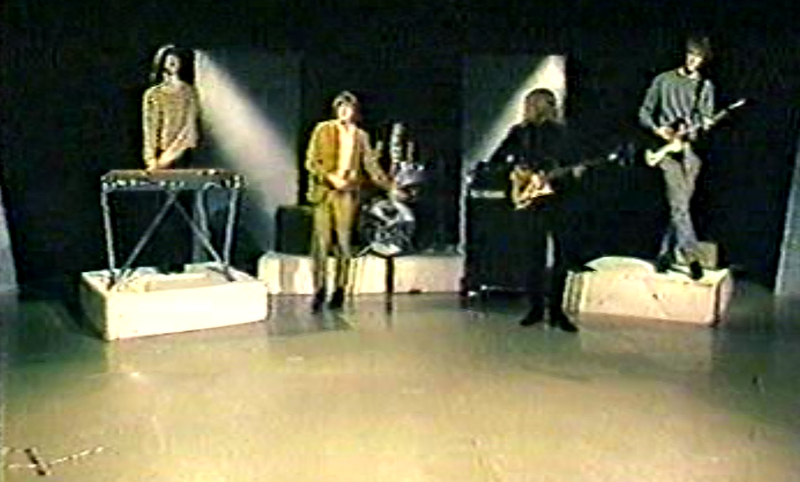 The Beat Farmers performing live on a 1984 episode of Club 33. Not that Montana was one to follow rules. Cox studio operators had banned all liquids from the studio floor, in order to protect the sensitive equipment. 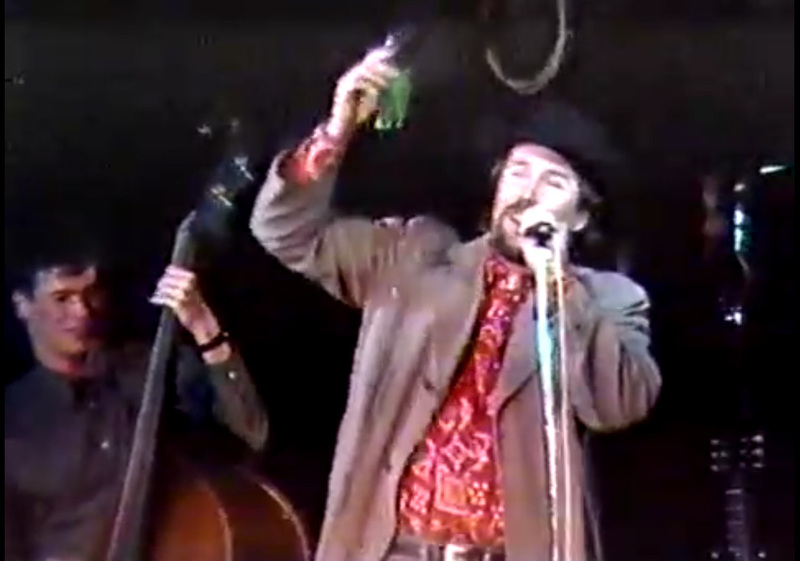 Despite this, Montana can be seen in the footage producing beer after beer from the flaps of his overcoat, at one point attempting — but failing — to balance an open bottle atop his hat. So much beer was spilled that Club 33 was temporarily forbidden to tape live with an audience, and bands had to resort to miming their performances. Ironically, by Autumn 1984, Club 33's main sponsor was local keg source Beer King. December 1983 episode of Club 33 featuring Manual Scan performing "The American Way." "We had to lip sync," recalls Bart Mendoza of Manual Scan's appearances. "The [TV production] students built the sets without our input, the first we saw them was when we arrived at the studio. We taped videos for all five songs on the Plan of Action EP, but we were only on three episodes." Did Manual Scan's early '80s appearance on local public access TV have an impact? "I would say it did, and it still does. The show picked from amongst the most popular bands in town at the time, so we were in great company. There wasn't a lot of music on TV back then, so lots of local music fans watched, and that was reflected a little in local draws. For people who were already into the bands, it was confirmation these bands were good, but also, for a lot of folks, it was an intro to our scene. And of course, decades later, some of these bands are still highly respected, so it's great that these clips even exist. This is likely the earliest and only pro footage of many of these bands." As Club 33 rolled towards the end of 1984, they had secured other program sponsors such as New World Audio on Mercury Street and Flashback Stage Lighting on Ewing Street, a clear indication that local musicians were a large part of the intended audience. The Reader's beta stash also includes tapes of other local public access music shows of the 1980s, including the Neat miming to a track specifically recorded for their appearance on Pacific Videos. "I don't remember who contacted us," recalls Anthony Downey, "but we were given about a week's notice, which didn't give us much time to record the songs for the videos, which we recorded in our own rehearsal studio on a four-track reel-to-reel. I think that it was pretty much a given that we would be lip syncing to the videos. We were approached once again a couple of months later to do the Club 33 show...I think it was one of the DJs from 91X, T. Bryon Shock, who got our foot in the door for both occasions. He was the MC at a couple of North County concert events featuring local groups." Selections from the Beat Farmers episode, as well as clips of the Tell-Tale Hearts, the Monroes, and many others can be viewed on the Reader site and on the Youtube channel BetaGems.